Hello Piso Fare friends! 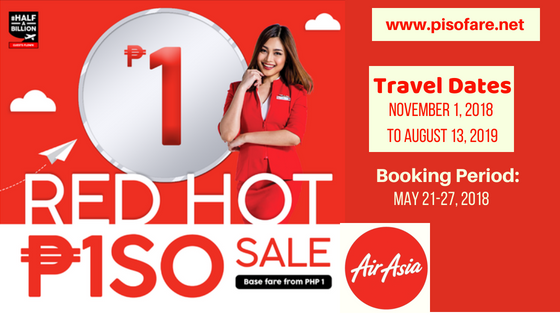 Another round of Air Asia Red Hot Sale will soon be offered! Mark your calendars now! Brace yourself for awesome low fares for as low as PHP1 BASE FARE for select local and international destinations. Mark your calendar for this upcoming big sale of Air Asia! As of this time, exact fares and routes are not announced yet. Wait for the updates in our Facebook page! According to the airline announcement, the Air Asia Piso Sale will be from Manila, Cebu, Clark and Davao. In the Philippines, Air Asia fly to Manila, Caticlan (Boracay), Cebu, Clark, Davao, Iloilo, Kalibo, Puerto Princesa, Tacloban and Tagbilaran. Direct flights of Air Asia from the Philippines to international destinations include Bali, Hong Kong, Kota Kinabalu, Kuala Lumpur, Macau, Seoul, Shanghai and Taipei. However, Air Asia has many connecting flights to various foreign destinations via Manila to Kuala Lumpur. Air Asia BIG members can book for the promo starting 12 midnight of May 20, 2018. The Red Hot Sale will be available to the public on beginning Monday, May 21, 2018 at 12 midnight. Travel Dates for the promo include November, December 2018 as well as January until August 13, 2019. To get the Air Asia cheap tickets, you need to book online at Air Asia website: www.airasia.com starting May 20, 2018 for BIG members and May 21, 2018 for other travelers. Book as soon as the clock strikes midnight on the above dates. However, have a lot of patience when searching for the P1 base fare promo. For sure, many travelers will be booking at the same time. Prepare your planned travel dates and passengers details as early as now. Be ready also with your Credit Card or Debit Card when you will be paying your tickets via these payment methods. Although payment of Air Asia piso sale tickets can be made via Air Asia Payment Partners, paying thru credit/debit cards can assure you of your slot right away. Air Asia piso fare promos are limited and can be availed on a First Come. First Serve basis! Check promo updates of Air Asia red hot sale 2018- 2019, Piso Fare 2018- 2-019 and other airline promos in our Facebook: PISO FARE TICKET! Like us in Facebook to receive piso fare and red hot sale updates!